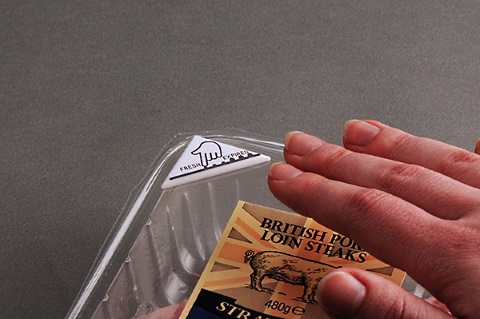 A London-based inventor has created a bio-reactive label that's much more accurate than a "best if used by" stamp. How many times have you looked at items in your fridge and wondered if they’re still okay to eat? Food products come with a number of dates—”Best By,” “Sell By,” “Enjoy By”—that can get seriously confusing. GMA recently spoke to Dr. Michael Hansen, a senior scientist with Consumer Reports. He told them all those labels actually mean nothing. Enter the Bump Mark. It’s a bio-reactive label created by London-based designer Solveiga Pakštaitė, which uses gelatin that breaks down at the same rate as the food in the package. Obviously it wouldn’t work for every type of food, but it would be ideal for meats, poultry, and fish. How does it work? You simply run your finger over the label. If the label is smooth, your food is fine. If you start to feel bumps, that means the gelatin is breaking down—just like your food inside the package—and you should proceed with caution. This system is ingenious, because we’ve all seen those packages of meat that some customer took from the cold case, then abandoned—nowhere near a refrigerator case—in the chip aisle. No other expiration date labeling system keeps track of the temperature changes that food item has gone through. FastCo adds that Pakštaitė is also looking into using plant-based gels in place of gelatin, so if Bump Marks end up in use on vegan food items, there won’t be a conflict of interest. Big Think notes that Pakštaitė is currently looking for a commercial partner to bring this labeling system to market. Bump Mark won the Inclusive Design Award and the James Dyson Foundation scholarship in this year’s Dyson Awards.